Prevents against "false purge" conditions generated by low chiller condenser vapor temperature or refrigerant stacking in the purge vessel. Maximum purge pumpout safety prevents refrigerant loss. Excessive purge count indicates possible leaks. Programming operations is an easy menu-driven procedure. Energy saving mode shuts down the unit if noncondensibles are absent. Automatically purges air from idle chillers for better start-up efficiency. 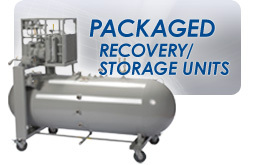 No Need to Drill & Tap Condenser Shell, unit returns refrigerant to the chiller evaporator. Adapts to any brand of chiller and conveniently installs near floor level. (LxWxH) 36" x 25" x 30"